The funeral for Ray Brown, of Starbuck, Minnesota will be held on Saturday, November 24, 2018 at 1:30 p.m. at the Immanuel Lutheran Church, rural Starbuck, with Reverend Paul Johnson officiating. Visitation will be on Friday from 5 to 7 p.m. at the Starbuck Funeral Home in Starbuck and for one hour prior to the service at the church on Saturday. Burial will be in the church cemetery. Raymond Erscel Brown, son of Erscel and Helen (Brown) Brown, was born on February 18, 1934 on a farm near Hancock, Minnesota. Ray grew up and attended school in Hancock, graduating from Hancock High School in 1952. Following his schooling, Ray moved to Starbuck, Minnesota where he worked on a farm until February of 1957. He was united in marriage to Sylvia Brown on August 10, 1957 at Immanuel Lutheran Church, rural Starbuck. Ray began working at the Starbuck Creamery in 1957 bottling milk. He drove bulk truck and can truck on the milk delivery route. Later, Ray worked in the office and became assistant Manager. In 1969, Ray and Sylvia moved to their house near Starbuck and raised their family. In 1996, Ray retired from the Starbuck Creamery. Following his retirement, Ray worked as a custodian at Hobo Park in Starbuck. Ray devoted himself to caring for his wife Sylvia, throughout her long battle with MS. Sylvia died on March 12, 2013. Ray kept his house in Starbuck, but due to health issues, later became a resident of the Glenwood Retirement Village in Glenwood. 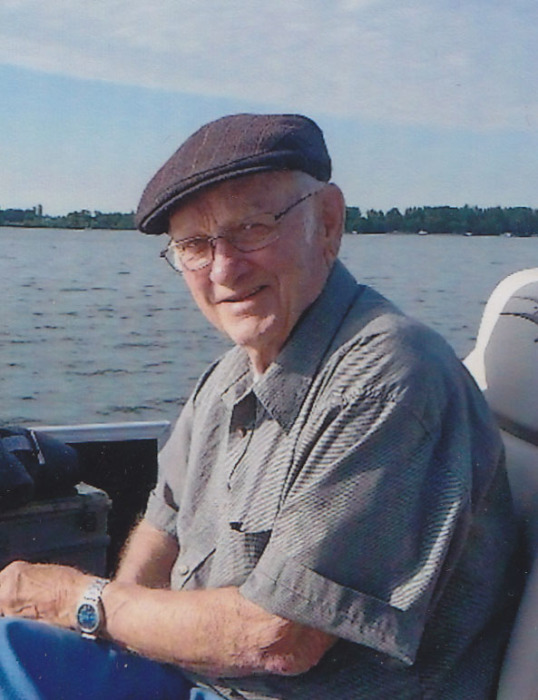 Ray was an active member of Immanuel Lutheran Church, where he served on many committees. He was also a member of the Hospital Board in Starbuck. He enjoyed gardening, hunting, fishing, bird watching, playing cards and yard work. Children were important to Ray, especially his grandchildren and great-grandchildren. Ray died on Monday, November 19th, 2018 at the Glenwood Retirement Village in Glenwood, Minnesota. He was 84 years old. He is survived by three children: Terry (Nancy) Brown of Starbuck, Shelley (Lonnie) Koloski of Alexandria and Stacey (John) Collins of Scottsdale, AZ; eight grandchildren: Ashley (Gregor Ferry) Grimsley of Spicer, Mitchell (Shanna Johnson) Brown of Alexandria, Megan (Chris) Hoberg of Hartford, SD, Rebecca (John) Olson of Georgetown, Matthew Koloski of Everett, WA, Tyler Koloski of Burnsville, Nicole (Erik Goodman) Tharaldson of Waconia and Stephanie Tharaldson of Minneapolis; ten great-grandchildren: Kaitlyn, Connor, Shayla, Blake and Traeton Grimsley, Abby and Kayden Johnson, Christian Hoberg, Brenna and Nolan Olson; siblings: Vernard (Barb) Brown of Morris, LeRoy (Ione) Brown of Glyndon, Don (Barb) Brown of Burtrum, Carol Lundebrek of Glenwood, Janice Swenson of Champlin, Lorraine (Marv) Hanson of Lakeville and LuVerne (Marlene) Brown of Starbuck. He was preceded in death by his wife, Sylvia; his parents and two brothers-in-law: Gary Swenson and Arnold Lundebrek.